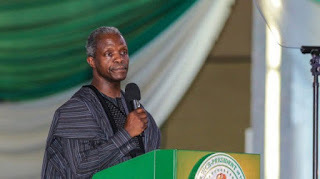 Vice President Yemi Osinbajo on Sunday admonished Nigerians to be continually thankful to God. He also urged them to look to the future with hope because of God’s faithfulness. Osinbajo spoke with State House correspondents after the end-of-year thanksgiving service at the Presidential Villa Chapel in Abuja. He was joined at the service by former Head of State, Gen. Yakubu Gowon, his wife, Victoria, Deputy Governor of Nassarawa State, Silas Agara, Minister of Niger Delta, Usani Uguru Usani, among other government officials. He said “My message to Nigerians is that we have every cause to be extremely thankful to God. He said God has a message for Nigerians for the coming months and years. “I think that what God is also telling us is that the coming month and the coming years will be even better. “Our country is going forward; our country is getting better and better; our country will prosper; our country will be a country of abundance. He said: “God accepts our prayers for Nigeria but not our selfish prayers. “Let God answer all the good prayer for Nigeria; what he thinks is best for Nigeria. He said the fact that Nigeria, with over 180 million people, still has peace and freedom of worship, showed that God answers the prayers of Nigerians. The first bible reading of the service, taken from Isaiah 51: 1-3 was taken by Usani Uguru Usani, while the second reading from Philipians 4:1-7 was taken by Mrs. Victoria Gowon.